Rohst Coffee Co.opened in September 2015 and is conveniently located between the Milwaukie Orange Line MAX stop and Milwaukie High School. Since opening, Rohst has become a popular destination and continues to improve upon our ability to serve high quality coffee and tea, and an atmosphere that is comfortable and conducive to fostering relationships and communication. 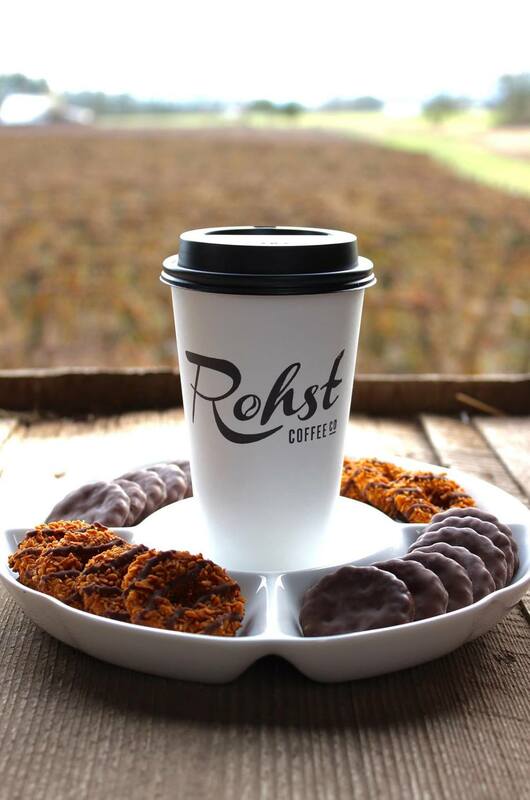 In addition to our cafe serving some of the best coffee in the area, Rohst also works to supply customers with top quality coffee beans, brewing equipment, and related products. Stop in for a drink, grab a bite to eat and check out our online store to find something you'll love to bring home. Rich espresso with steamed milk, topped with a light foam. Espresso with Ghirardelli Chocolate Sauce and steamed milk. Topped with sweetened whipped cream. Full bodied espresso with steamed milk, topped with a large layer of rich foam. Delicious espresso floated on water. Bold, straightforward double shot of espresso. Best served in a 4oz ceramic cup. Our "House Coffee" is currently a Dark Roast. It is a delicious, full bodied coffee with a strong finish. Check in often for special offerings of Single Origin coffees as well as specialty brewing methods, such as pour over or french press. Perfectly steamed milk with Monin Madagascar Vanilla syrup, marked with espresso. Rohst serves Townshend's Tea Company loose leaf tea. Stop in to see the varieties of tea we are currently offering. Spiced chai and steamed milk. Some may like this topped with sweetened whipped cream. Choice of flavor, mixed with steamed milk and topped with whipped cream. Rich Ghirardelli Chocolate Sauce with steamed milk, topped with whipped cream and some more chocolate sauce. Stop by and grab a Rockstar infused with one of our flavoring syrups. It'll be just the kick you need. Peach, strawberry, wild berry or green apple fruit smoothies with or without a dairy base. Great choice for cooling off on a nice hot day. Add some caramel to your green apple smoothie for a delicious caramel apple smoothie. A "pour over" involves a barista grinding just enough beans for a single cup of coffee, using a filter/brewer of some manner, and then brewing that single serving of coffee by mindfully pouring hot water over the grounds for a precise amount of time. At Rohst we've come to find that some of the best coffee we craft on a daily basis is brewed in the form of pour over. Our customers love them in the cafe and more people are starting to enjoy the craft of pour overs at home. Now you can own the same low-maintenance, dishwasher safe, portable, stainless steel dripper that we use in our cafe. Stop by to say hello or shoot us a message.